The 250 XC-F has been is an established force. 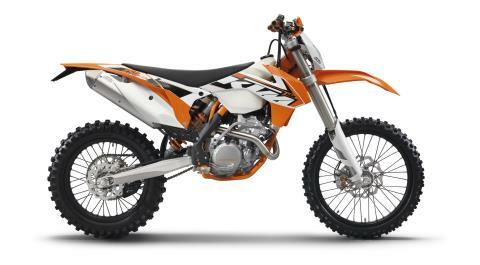 The feisty four-stroke 250 engine hits the scene with a new Supercross championship under its belt combined with cross-country competition in it's components. In fact, the 250 XC-F has taken Factory FMF/KTM rider Maria Forsberg to three consecutive Women's GNCC Championships and 2 X-Games Enduro X Gold Medals. The airbox design offers maximum protection of the air filter against dirt while ensuring maximum airflow for top performance. The Twin Air filter can be changed without tools in seconds, a standard for KTM. In shaping the bodywork, the KTM designers’ ergonomic and design focus was to achieve complete harmony between rider and bike, down to the finest details. The front fender is a prime example of a moulded polymer component gaining maximum stability through a well thought-out structure and mounting. XC models come with hand guards and side stand. All models of the XC range have high capacity translucent fuel tanks for cross country racing. The XC's have a new 1/4 turn fuel cap with an improved opening mechanism to make fueling during a race even easier. A new, refined graphic design with clear lines underlines the high demands made of a modern, state-of-the-art offroad motorcycle. All SX & XC models are fitted with the super strong, tapered Renthal Fatbar 827 whose bend is especially well suited to the requirements of racing. The proven standard KTM mount allows to fix the handlebar in four different positions. A large Renthal bar pad in a classy combination of black and silver, offers effective crash protection for the rider. For 2014, all XC models are fitted with a newly developed 48mm 4CS Closed Cartridge fork featuring the patented 4-Chamber-System. The sophisticated design provides very constant and sensitive damping characteristics and an adjustable end progression. The new hand click adjuster system is now accessible on top of the fork, rebound on the right hand side, compression on the left. The fork is fitted with improved seal rings made by SKF and high performance fork oil (SAE 4). Compared to the predecessor, the new 4CS fork is lighter , easier to maintain and has been completely valved to match the shock for XC racing. The cast aluminium swingarm has been developed with state-of-the-art calculation and simulation software and constructed, in terms of design and wall thickness, for minimum weight with optimum stiffness and precisely defined flexibility. For the 2014 model year, our engineers have revised the chainguide for the benefit of higher functional reliability, while simultaneously reducing the weight. The lower triple clamp has been modified for optimum attachment of the new front fender. Thanks to its new contour and attachment with two bolts from the front and two from below, the new fender boasts significantly higher stability. The wheels use lightweight, CNC-machined hubs, high-endrims and spokes coated in black with lightweight aluminumnipples to achieve maximum stability at minimum weight. The OEM Dunlop Geomax MX51 tires deliver perfect traction and outstanding performance. XC models come with an 18" rear wheel and Giant rims.